Ordinarily, this week would be the turn of a cafe-physics review but circumstances have meant that this will be postponed by one week, sorry. So instead, a question. How does your coffee cup resemble the universe? 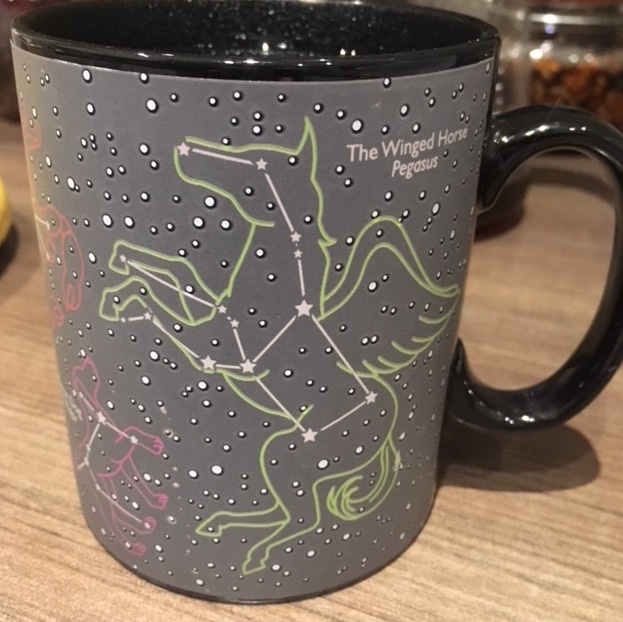 A few years ago, I was given a heat changing mug that revealed the constellations when the coffee within it was hot (and went black as the coffee was finished/went cold). 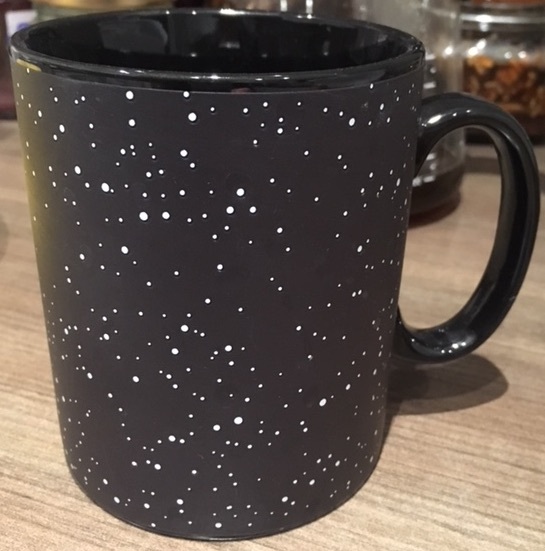 Although this is not the way that the universe resembles a coffee mug, the science behind these mugs is quite interesting and they do provide a clue to the connection. The answer (or an answer, you may think of more) is in the way that the mug emits heat. On a cold day with a hot coffee, I can be fairly sure that by putting my hands quite close but not touching the cup, I can feel the radiated warmth. Infrared waves helping prevent my fingers from becoming numb. Although there is air around the cup (even physicists don’t drink coffee in a vacuum) and so there will be heat transferred from the cup to my hands via conduction and convection, a large amount of the heat my hands receive will be radiated. It was by watching a candle flame between himself and a stove that Carl Wilhelm Scheele (1742-1786) inferred the presence of the infrared. For a coffee temperature of 60ºC (333 Kelvin), the cup would emit a range of light with a peak in intensity at a wavelength in the infrared of around 8.5 μm, about the length of a grain of espresso grind. The way that objects radiate heat is well known. Called a “black body spectrum”, all things radiate a spectrum that can be approximated to it, whether the object is a coffee cup or the universe, the difference is over what frequency range (or wavelength) the object radiates and where in the spectrum the light intensity peaks. The same cup as above but photographed when it is at room temperature not when it contains hot liquid. Coffee emits light (in the infrared) at 8.5 μm because it is about 60ºC. A ‘red hot’ iron rod, still emits light in a spectrum that peaks in the infrared but appears more red than my coffee cup because the peak in the radiated intensity has decreased closer to the red region of the visible spectrum. The universe emits radiation over the same sort of blackbody curve but the spectrum emitted by the universe peaks at a wavelength of around 2cm, much longer than the coffee cup and well beyond the infrared. In fact, the universe is emitting light in the microwave region. The longer wavelength means that the universe is a lot colder than a cup of coffee. About 330º cooler in fact because the temperature of the universe is a chilly 2.7K (or approximately -270ºC). The presence of this microwave ‘background’ was first detected in the 1960s. Further experiments in the 1990s with the COBE satellite and more recently with the Planck satellite have confirmed the almost perfect uniformity of the blackbody spectrum. No matter which direction you turn your microwave antennae to, you pick up the same background spectrum, peaking at about 2cm, all around the universe. This means that the background temperature of the universe is the same in all directions that we look, it is uniform. 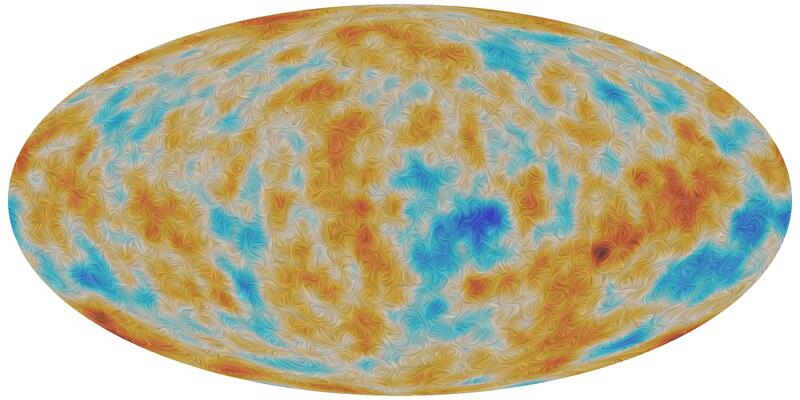 Indeed, it took until the sensitivity of the Planck satellite and more recently the WMAP data to show that the universe had any variation at all. And when it was revealed, it was a difference of about one part in a million. If we compare this to our coffee we can see from the lines of light that dance on the bottom of a tea cup that there is significant temperature variation within the cup. Even a difference of one degree would lead to a shift in the blackbody spectrum of the coffee cup by a few parts in a thousand: the background temperature of the universe is far more uniform than the temperature of your cup of coffee in fact the shift seems to be of the order of 0.0002º. But, apart from an interesting curiosity why would we want to measure the temperature of the universe or know the uniformity of a cup of coffee? One reason is that knowing the current temperature and its likely cooling mechanism, means that we can calculate how long the universe, or coffee, has been cooling. If I were to drink a cup of coffee that was cooler than about 60ºC I would know that either it has been prepared much earlier and left on the counter top or that it had been prepared using water below the optimum brewing temperature. If I note from the lines of light crossing the bottom of the cup that there is a lot of convection going on in my tea cup with cells of different temperature, I could think that it is either a very cold day or that I didn’t warm the cup before I poured the coffee or tea into it. Knowing the temperature of the universe allows us to check theories of how the universe formed (and therefore how it cools) by calculating its age and seeing if this matches with the age deduced by other means (by looking at the oldest star clusters for example). While looking at the minute temperature variations across the universe is also a test of the theories of the universe’s formation. There are clearly differences between the universe and a mug of coffee, even a mug that shows the constellations of the stars, not least the fact that the coffee cools into the universe but the universe’s cooling is different having nothing to cool into. Nonetheless, it is remarkable that the same physical laws and mathematics that describes your cooling coffee cup can be used to describe our entire universe. So sit back, take a deep breath, and enjoy the universe through your coffee cup.